Imagine moving to France or Spain to live and work. You are offered a job that fits your needs and you want to accept it. The one drawback is that you don’t speak the language. How would this affect your productivity and future advancement? What’s that? The company you are going to work for in this foreign land and culture offers evening classes in the native language. A questionable opportunity has turned into a great opportunity. The goals of the ESL program are as follows: To improve safety procedures, how to ask questions, how to respond on the job with fellow workers, building supervisors and contractors, and how to refer customers to the office staff. Shortly after the first class graduated the program gained national attention in the construction industry. In February the program was featured as part of the “Education Spotlight” in San Antonio, Texas at a co-sponsored event, the CCA and Kohler/PHCC National Educational Foundation Seminar Series. LeDuc & Dexter realizes the potential of this program as a company resource for valuable employees, LeDuc explains, ” We see the Latino workforce as a big part of the future of the company. 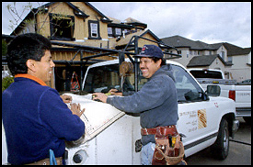 We have a network of Hispanic people at LeDuc & Dexter that has led to the hiring of their friends and relatives.” In fact, almost 25% of the field employees at LeDuc & Dexter are from the Latino community. Aside from the new group that is preparing to start their ESL program, LeDuc & Dexter will be offering an advanced English class to those who graduated from the first ESL class. LeDuc & Dexter is also exploring the possibility of offering Spanish-speaking courses for English-speaking employees in the future.